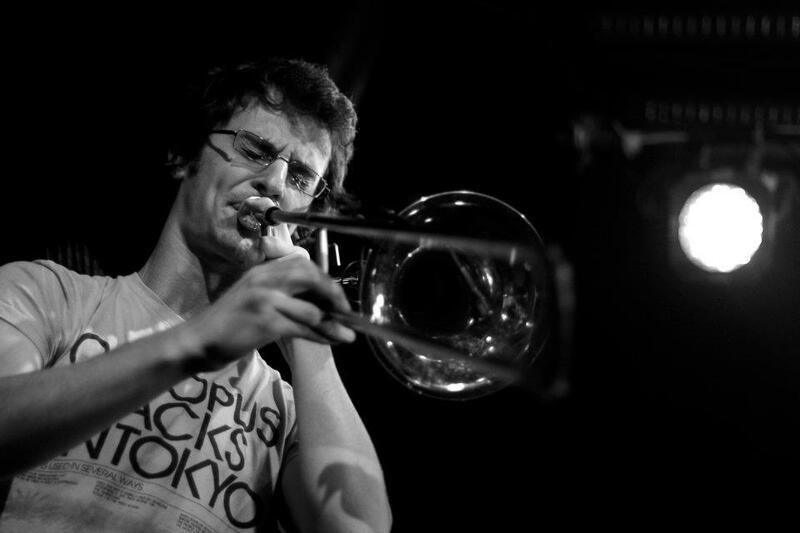 Raph Clarkson is a trombonist, improviser, composer and educator, born and bred in London. After studying music at the Universities of York and Oxford, he has developed an eclectic musical career, which spans trad jazz, contemporary jazz, avant-garde improvised music, theatre and performance art, rock/pop, contemporary classical music, ska/reggae, South African township jazz, and salsa. He is best known as the trombonist for the award-winning jazz-punk ensemble WorldService Project, which has seen him tour Europe, China and the USA, performing at the London, Tampere, Tokyo and Umea Jazz festivals amongst many others; the band represented the UK as 12 Points Festival ‘Plus’ artists. WSP have also been heavily involved with the Match&Fuse european exchange and touring network, collaborating with artists from across the continent. Match&Fuse also represents Raph’s passion for educating; he has led workshops and projects in schools in the UK and abroad for M&F, is a co-founder of the Be Creative Music organisation, and recently held a place on the prestigious Spitalfields Music Leader Traineeship. More recently he has been involved in educational work curated by English Touring Opera, English National Opera, Opera Holland Park and the London Philharmonic Orchestra, and has this year been leading projects for Creative Futures, the Royal Philharmonic Orchestra, the BBC Scottish Symphony Orchestra, the Kazzum arts organisation, Spitalfields Music, Sinfonia Viva, Mid Wales Music Trust, and Share Music Southwest. Raph has developed a compositional and improvisational interest in the intersection between the trombone and the voice/words, and is exploring this with his ensemble The Dissolute Society, for which he writes words and music; this year the ensemble released their debut album Soldiering On (Babel Label) featuring piano virtuoso Huw Warren as a guest, described as “wild…fearless…thrilling” (birdistheworm blog). As a composer Raph has also been commissioned by Sinfonia Viva to write music for young voices and orchestra, as well as for brass ensemble; an upcoming commission comprises a setting of John Donne’s Death Be Not Proud for soprano and chamber orchestra. He wrote the horn arrangement for the worldwide charity single Human Kind, which was recorded by members of Snarky Puppy; and he is contributing horn arrangements to This is Kalba, a collaborative U.K.-Ghana album curated by grammy-nominated producer Sonny Johns and featuring musicians such as Laura Jurd and Mark Lockheart. Recent projects include: U.K. festival gigs with Shed 7; touring with the free-improvising Speckles Brass ensemble, which Raph co-founded; performing with the Engines Orchestra and their collaboration with Femi Temowo; creating new music and workshop projects for a residency in South Africa supported by the Help Musicians ‘Emerging Excellence’ strand, which led to the formation of Raph’s new ensemble ‘Equal Spirits’; and international touring of WorldService Project’s latest album Serve. This year he has also performed with Portugal. The Man, Brassroots, Perhaps Contraption, The Overground Collective and Renegade Brass Band, as well as contributing to Benin City’s album Last Night. Next year he will embark on a U.K.-wide tour with The Dualers, as they record and release a new album, and perform with Laura Jurd’s new project Stepping Back, Jumping In. Raph will also be releasing his second album with Babel Label in April 2019, featuring new band RESOLUTE, formed from the Dissolute Society family.